Yesterday I was ready to link to my party list, and our Internet service from Sacramento to the Oregon border went down. It was down until this morning. Wow!!! Did miss my blogging and Candy Crush Saga. LOL. We've finally had some rain in Northern California. I'm so happy I finished pruning my roses and grapevines before it started to rain. The daffodils bulbs are about in inch out of the ground now and the roses have little leaves sprouting on the branches. Today, I received a letter from the Rose Society asking for a description of my garden. I've been thinking about how to describe a labor of love for over 45 years in a couple of paragraphs. I'm so excited about the whole adventure of a Garden tour in our yard. I found this Amaryllis bulb on sale in the nursery for $1.50 after Christmas. It was already sprouting and just needed to be planted and watered. I snapped a few photos of the Amaryllis with all four blooms at their peak beautiness. Sometimes; I don't get my camera out and wait too long before photographing something beautiful. But I think I got it today. After the bulb is finished blooming I trim it down and plant it in the garden. I bought another Amaryllis the other day and it's red. Hopefully it will beautiful in a week or so. I'm so excited for Spring. Here in Indiana, it won't happen for awhile and I'm itching to get outside and enjoy the warm weather. We still have a foot of snow on the ground. UGH! How fun to be on a garden tour. Here in southern California, we need rain. I am using "gray" water to keep my plants watered. I told myself that my garden would be beautiful once I retired, but then I got a puppy who digs up new plantings and then the drought. Beautiful...Oh! Spring cannot come too soon! So beautiful. Great to have you at Seasonal Sundays. Your Amaryllis is just lovely! Beautiful images. I am looking forward to spring and to see flower blooming once again. Enjoy your week ahead! 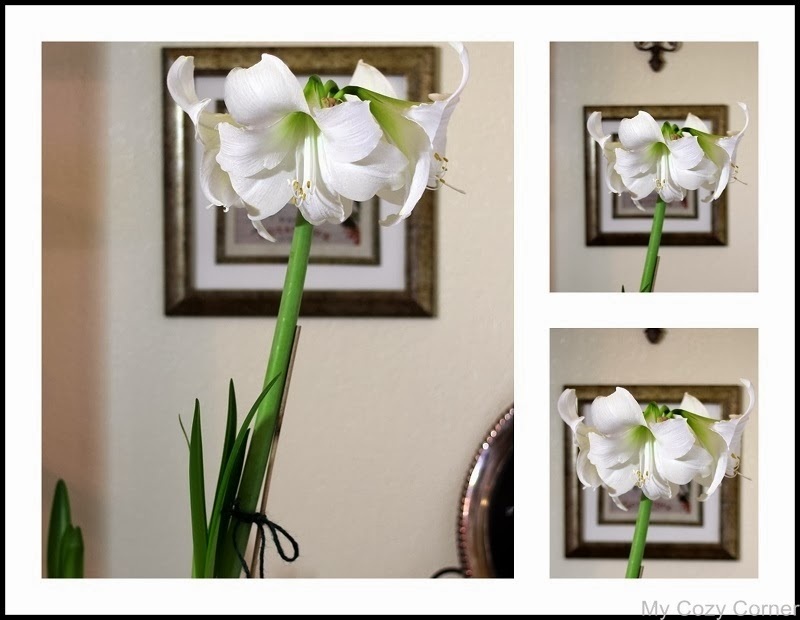 Joyous is the word for your beautiful Amaryllis and you photographed it at the perfect time! I'll look forward to seeing the red one next time - they are such majestic blooms!